First step in the TR's transition from uncomplicated, rugged sports car to something altogether more refined, the TR4 was introduced in 1961. Giovanni Michelotti's new bodyshell brought the styling bang up to date while beneath the skin there numerous chassis changes. Rack-and-pinion steering, widened front and rear track, and an all-synchromesh gearbox contributed to improved driveability, while wind-up windows were a big advance on the preceding TR3's primitive side screens. The standard engine was the 2,138cc four-cylinder overhead-valve unit first offered on the TR3A, and when equipped with the optional overdrive the TR4 was good for a top speed of almost 110mph. Today, the four-cylinder TRs are among the easiest of post-war classic sports cars to own and maintain, being supported by a multitude of component suppliers and other specialists. A rare factory option was the hardtop known as the "Surrey Top", an early attempt at a Targa. The hardtop panel featured a removable either hardtop or softop center panel, giving any TR4 so equipped a versatility unique at the time. Finished in Signal Red with a black leather interior, this TR4 was subject to a comprehensive restoration that was completed in 2008. The body and frame were stripped down to the bare metal—revealing them to be straight and accident-free—refinished and repainted. Mechanically the engine was completely torn down, balanced, and rebuilt. For ease of use and reliability, the crankshaft was machined to accept a modern rear main seal which eliminated the usual oil spots found under just about every British car and the head was fitted with hardened valve seats to make usage of unleaded gasoline a non-issue. Inside, a completely new interior purchased from Moss Motors was professionally installed. In all cases, inside and out, parts were refurbished or replaced—with virtually every wear related part subjected to the latter. A full listing of the work completed and the parts replaced is included with the car. 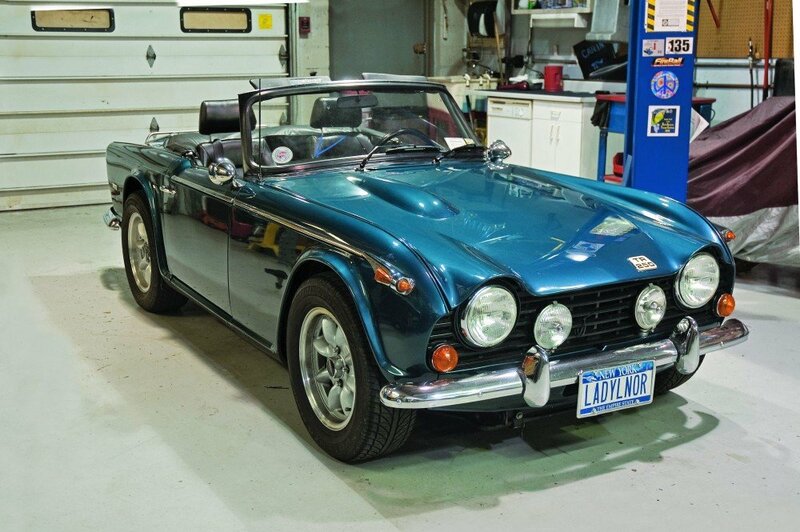 Riding on a set of original 1960s America Racing magnesium wheels wrapped in Bridgestone Potenza tires, this TR4 will definitely make for plenty of back road enjoyment. With the vinyl top section removed, one can enjoy open air motoring with minimal wind buffeting. Showing well today, it has been kept in a climate controlled garage since it was purchased by the current owner and regularly maintained. With a number of concours trophies already to its credit, it would certainly be welcome at a range of events and tours and it will undoubtedly provide many hours of driving pleasure to its next owner.